Gratteri, a deputy prosecutor in Reggio Calabria, a city in southern Italy, is a well-known foe of Calabria's notorious mafia, known as 'Ndrangheta. The mob's anger with the Pope centers on the Vatican Bank, which the new pontiff has tried to reform, according to experts on the Italian underworld. Vatican officials were not immediately available for comment. Earlier on Thursday, a Vatican spokesperson strongly denied any concerns about the Pope's safety. "The Holy See is not at all worried," the Rev. Federico Lombardi told the French wire service Agence I.Media. "These are the usual inventions." In June, the Pope established a five-person papal commission to investigate the activities of the Vatican Bank, which has been under pressure from international finance authorities to clean up its murky business practices. "The church never raised the issue," he said. "The church has never excommunicated a mobster." More recently, the mafia used the Vatican Bank to smuggle money, Nicaso said, though he offered no specific evidence. The Pope's reforms threaten that arrangement and will anger organized crime, he added. "We believe that this is an unprecedented challenge to the economic power center of the Vatican, and for that reason he may face some kind of risk," Nicaso said. The Vatican has strongly denied any ties to the Italian mafia at the Vatican Bank or at any other church institution. The Pope's penchant for wading into the massive crowds who attend his speeches and events poses a particular security risk, Nicaso said. "He has to be more cautious. 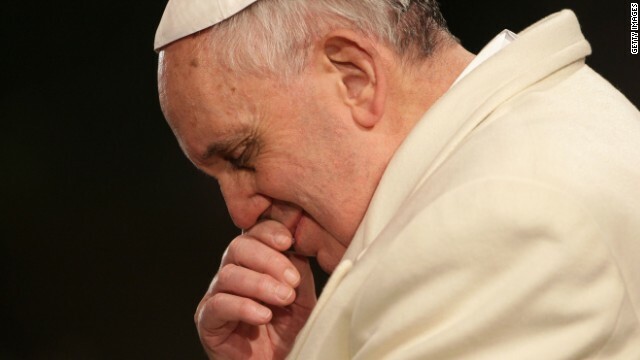 He can't go walk around Vatican Square anymore like he's a normal person." Asked if the mafia would dare try to assassinate such a popular figure, Nicaso said, "There are so many ways to kill a pope. They have to be careful. But in the history of organized crime, whenever they had to remove an obstacle, they never thought about the consequences." "He is changing the church," Nicaso said. "It is not a church of power and luxury anymore, and his promise to restructure [the Vatican Bank] is like a Copernican revolution." 15 The whole world of mankind is now about to face an awe-inspiring spectacle. This will be the turning of the political powers against Babylon the Great, with the aim of wiping her out of existence. This may sound heart paralyzing to people who sincerely believe that all religions are good. But the Universal Sovereign, Jehovah God, has determined that Babylon the Great has no place in all the universe and that she has befouled the realm of creation long enough. She must be violently brought down to utter destruction. 16 There are already on hand powerful agencies that God can allow to effect her destruction, namely, the political elements of the world. The God-inspired book of Revelation foretells that Jehovah will turn her lovers against her, and they will strip her naked, exposing her for what she really is—a demonized fraud! And then they will, so to speak, burn her with fire and reduce her to a pile of ashes. They will give her a treatment similar to what she gave to the uncompromising worshipers of the true God.—Revelation 17:15-18; 18:24. 17 This violent antireligious action on the part of the political powers does not mean that they will thereafter turn to the worship of Jehovah God. Their fierce anti-Babylon action does not mean that they will now become the friends of God. Otherwise they would not take the later action that the book of Revelation shows that they will take. (Revelation 17:12-14) They may rejoice immensely at the antireligious exploits that Jehovah God has permitted them to accomplish, but they will still continue to be misled by “the god of this system of things,” Satan the Devil, the all-out, relentless opposer of Jehovah God.—2 Corinthians 4:4. 18 Babylon the Great will not survive to see the grand climax, the vindication of Jehovah’s universal sovereignty by means of the “Prince of Peace,” who is now the “Mighty God” at the right hand of the One Almighty and Supreme Deity, Jehovah.—Isaiah 9:6. 19 On the sidelines, under impenetrable divine protection, will be the witnesses of Jehovah. (Isaiah 43:10, 12) Under command from the righteous heavens, they will obediently have got out of Babylon the Great. (Revelation 18:4) Their righteous pleasure will be unbounded at what they witness. They will thereafter forever be witnesses of Jehovah and eternally be able to testify with regard to his vindication of himself over Babylon the Great.—Revelation 19:1-3. Organized crime is angry at organized crime...the cath o lic church is a mafia in it's own right......compet ition for the dirty money they live on. Hypocrisy.